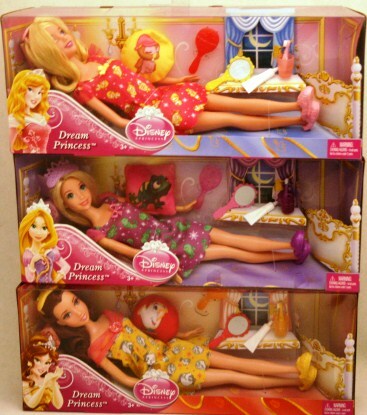 2012 Disney Dream Princess RAPUNZEL SLEEPING BEAUTY BELLE 3 Dolls NEW! Getting ready for bed is a dream come true with this adorable collection of bedtime-themed princesses. Each princess wears a royal nightgown and comes with a character-friend pillow and bedtime accessories, making her the perfect companion for every girl's bedtime routine! Product Measures: 2.5" x 12.75" x 5"
Brand new and never removed from nice packages!